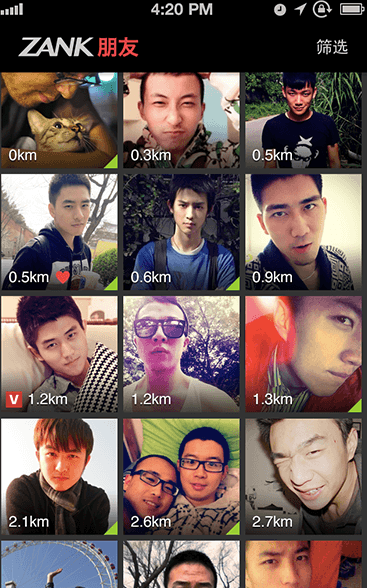 Zank, a social app for male homosexuals in China, has just closed a multi-million USD series A funding round. The investment bolsters its previous funding by Matrix Partners China shortly after Zank launched in May, 2013. With a pronunciation similar to “awesome” (zan, 赞) in Chinese, Zank is not the only LGBT app that has gained favor in China’s investors. Blued, a social service similar to Zank, raised a multi-million series A round from Crystal Stream this February. Gee Yuu is another app that has netted investments. What should be noted is that all three apps target gay men. CEO of Zank Jeff Ling comments that LGBT apps across the world are mostly male-oriented. That said, the demands for male and female homosexuals are about the same. Zank’s subsidiary Laven is one of the first-comer apps for gay women in China. China’s LGBT market is indeed opening up, according to Paul Thompson, founder of LGBT Capital, a wealth management firm with a focus on Asia’s LGBT market. Not having children allows the group to have higher disposable income. After all, homosexuality is no longer a taboo in China. It has been was removed from an official list of mental illness in 2001. In 2003, Fudan University in Shanghai offered China’s first undergraduate gay studies. Zank asked several thousand people in a survey “do you think our society supports homosexuality?” An astonishing 70% of the respondents said “yes.” This is especially the case in big cities. On the other hand, there is still parental pressure on the LGBT community especially given China’s one child policy. As such, many gay couples go into “co-operative marriage”. In these arrangements a gay couple will marry a lesbian couple on paper but in practice each of the loving couples still live together. China also has no civil-rights law to protect gays against discrimination. Designed for gay men, Zank is a hybrid of photo-sharing community, events publishing platform and location-based private messaging. How does the needs of male homosexuals differ from the mainstream market? “We are serving a community, not a single demand,” Jeff says. What he means is that the gay community, though sharing the same sexual orientation, possesses a lot of different demands, ranging from networking, job-seeking, finding roommates, work-out, travelling, among a host of others. Since it launched, Zank has struck cooperation with a number of brands coming from skincare, films and tourism. Concerns for confidentiality also makes the anonymous Internet a perfect tool for homosexuals, Jeff adds. To better protect user privacy, Zank will add an invisible option to its new version. An Internet startup, Zank’s founding team is a homosexual group, but now over half of the employees are straight. Zank currently has over 500 million users. Zank has just conducted a comprehensive research on the purchase behavior of China’s LGBT groups, the first study of this kind in China. The study gives us a glimpse of the market for gay men in China. For one, apps for homosexuals are mostly male-dominated as mentioned above. According to Jeff, this is a result of “culture” – the lesbian circle is not as open as the gay circle. Zank also found that the favorite mobile phone brand for gay men is Apple, followed by Samsung and Xiaomi. In comparison, straight men like Samsung most, followed by Apple and Xiaomi. As for sportswear, gays rank Nike, followed by Adidas, New Balance as their favorites whereas Li Ning, Nike and Anta are straight men’s favorites. Interestingly, gay men has a far lower demand for cars and houses than straight men. Zank reckons this is a result of the absence of families in which cars and houses are a must. This echoes the claim by LGBT Capital that financial pressure from marriage doesn’t apply to the LGBT community. Revenue-wise, the business model of social services like Momo, Path and WeChat acts as examples for Zank, Jeff says. Gaming, advertising and membership fees have been Momo’s revenue streams, whereas WeChat has brought in stickers, mobile commerce, gaming, Dianping group-buying, and transaction-based payment commissions. In the end, users are the most important aspect for Zank, Jeff says. This is why the team produced a series of microvideo comedies to source users, which have over 25 million plays. Through the works, Zank also hopes to present a positive image of homosexuals to the public.